David Shannon illustrated his first book in 1989, How Many Spots Does A Leopard Have? And Other Tales by Julius Lester. He described the beginning of his career this way, "I got involved with children's books almost by accident. I was amazed at the quality and variety of children's stories, and more and more found myself drawing things I drew as a boy - baseball players, pirates, knights, and Native Americans. 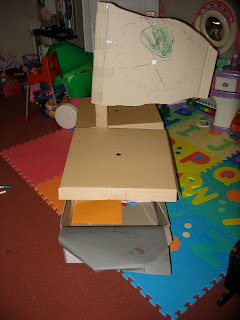 I realized that children's books were what I had been working toward my whole life." (biography.jrank.org). After Spots?, Shannon illustrated many books for other authors including The Rough-Face Girl by Rafe Martin and self-illustrated a few books including How Georgie Radbourn Saved Baseball. It wasn't until 1999 that he was awarded Caldecott Honor for his most recognizable book, No David. Amazingly, this book's first draft was completed when Shannon was only 5 years old. In the following video from Reading Rockets, David Shannon describes how No David evolved from those early ideas. When I celebrated David Shannon's birthday as a teacher many years ago I remember reading the book Encounter by Jane Yolen which was illustrated by David Shannon. This book was about the arrival of explorers in the New World as told from the perspective of a native boy. I love the illustrations in this book which are much more realistic than the illustrations found in the No David! Series and Shannon's Alice The Fairy. This week I wanted to explore more of Shannon's early illustration work which lead me to another book by Jane Yolen, The Ballad of the Pirate Queens. This book is based upon the true story of two female pirates who were captured, along with the rest of the crew, after the men failed to help them fight. Their lives were spared by the judge because they were pregnant, but the men met their demise. I did not read Pirate Queens to my children, but we did read How I Became a Pirate and Pirates Don't Change Diapers by Melinda Long and illustrated by David Shannon. These books along with Shannon's Too Many Toys sparked the idea for this week's activity. In Too Many Toys, the boy's toys are taking over the house and it is time for Mom to negotiate the departure of as many toys as possible. After heavy negotiations, a huge box of toys is packed, but soon unpacked by the boy when he decides that the box is his new favorite toy. 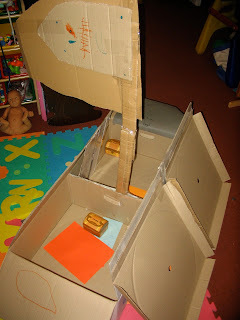 I had many empty boxes, a big roll of packaging tape, and the imaginations of two young children that allowed us to make a very cool pirate ship. The afternoon was filled with "Shiver me timbers", "Ahoy Mateys" and no fighting between the siblings! ARRRR! Check out David Shannon's latest book, It's Christmas, David, that was released on September 1, 2010. I had no idea he had a new book coming out! Yay! Love David Shannon! We actually met him this year at the LA Times Festival of Books and he's amazing. Well, and absolutely hilarious! It was incredible to see how his youth inspired his illustrations, from how he draws to what he draws. I honestly hadn't seen his Pirate book though, I'm going to check it out. Thanks!